The plan, which builds upon the original award-winning Landscapes that was adopted over 20 years ago, establishes a vision for the county and its municipalities; guides county government decision-making; guides municipal planning and implementation; and provides a framework for collaboration across municipal boundaries. Landscapes3 has been a collaborative process for the past two years in which county officials and planners gathered input from municipal officials, residents, business owners, and other stakeholders. Development of Landscapes3 was guided by the Planning Commission’s nine-member volunteer board and a steering committee of 27 members who volunteered their time and expertise. Read the Chester County Commissioners’ statements about the plan. 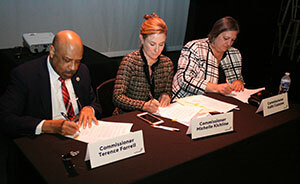 The steering committee’s three co-chairs were Matthew Hammond, chairman of the Planning Commission board and executive vice president of Traffic Planning and Design, Inc.; Molly Morrison, Planning Commission board member and Natural Lands president; and Christopher Alonzo, chairman of the county’s Agricultural Development Council and president of Pietro Industries. Below are their statements about the plan. Now that Landscapes3 has been adopted by the Commissioners, the Planning Commission board and staff will begin working on implementation of the plan with the help of municipalities, partner agencies, and organizations. Below are some of the highlights of the Landscapes3 Work Program for 2019.
holding an open space summit. creating a program for assisting municipalities with their natural resources. initiating an adaptive reuse design guide. creating an inventory of redevelopment sites. developing an up-to-date inventory of trails in the county. Ongoing major Landscapes3 initiatives include updating the Vision Partnership Program, maintaining the Pipeline Information Center website, and continuing the Act 247 review process for subdivisions, land developments, ordinances, and plans. In addition to the goals and vision, the plan includes an interactive map that was influenced by the Landscapes2 Livable Landscapes map, which identified growth and resource areas. The Landscapes3 map has retained the same categories, but has been updated to reflect existing development and preservation in our communities, as well as proposed and planned development projects and preservation efforts. Learn more about the plan and view the executive summary.